The World’s Largest Crow is one of those rare, phenomenally realistic, well-done enlargements of everyday life. Located in the Crow Lake area, it was amazingly equipped with it’s own Promotional Materials, as well as an Audio Message explaining the symbolism of everything. 18 feet high, the branch is 31 feet long. Built with a metal skeleton, plastic form, fiberglass skin and automotive paint. 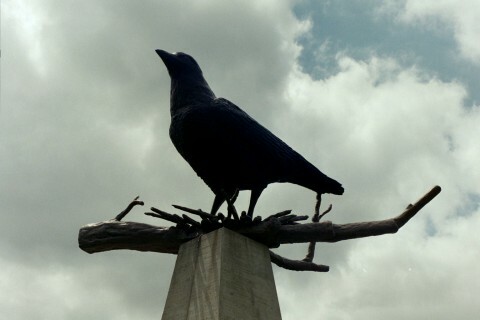 Built by a team of volunteers, but I don’t know the designer of the crow itself, or exact build date, although the memorial is the 1988 Centennial Memorial.